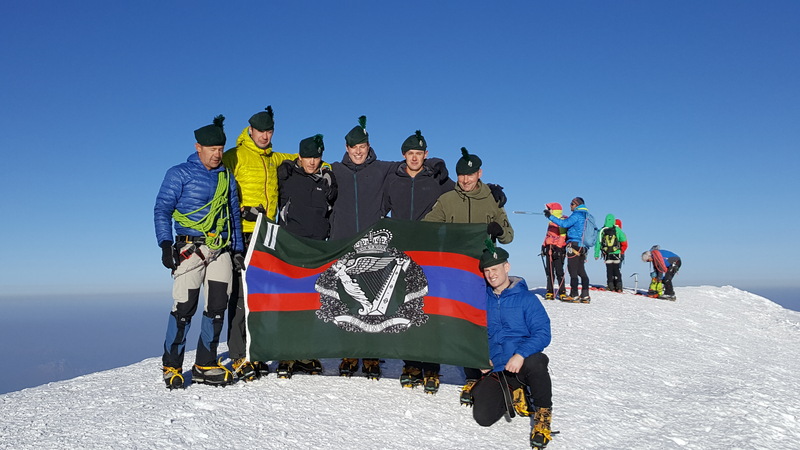 On the 16th June 17, myself and a team of mountaineers left Northern Ireland heading to Chamonix, France for what would be one of the most memorial experiences of my life. Flying into Lyon it was late evening when we arrived in Chamonix. Despite the long journey, seeing the mansion that our exercise planner managed to acquire for us the stresses of the travel were soon forgot about. And when I say Mansion, I mean a Mansion. The villa was perfect for our base location with a balcony displaying a picture perfect view of Mont Blanc to remind us of what we would have to do over the coming days. We were quickly into action, organising our mountaineering equipment and receiving confirmatory briefings in preparation for 8 days of relentless mountaineering activities. 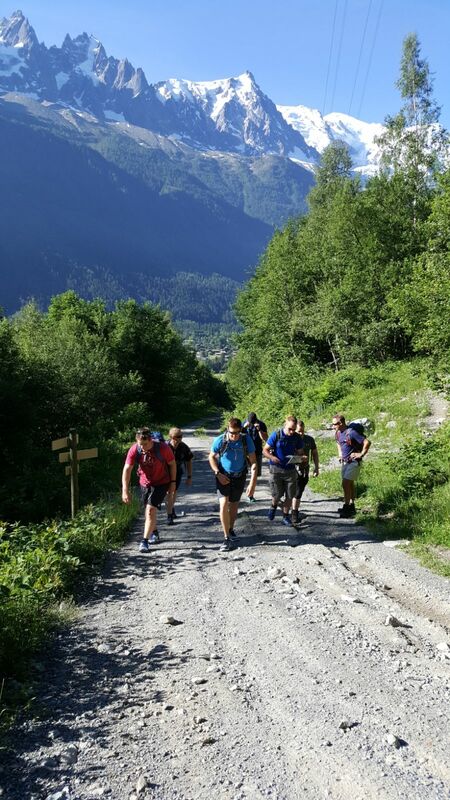 On the morning of 17th we started our training with a ‘gentle’ acclimation walk up to Lac Blanc (2,352m). This walk turned out to be more strenuous than imagined. It didn’t take long to realise that looking at contours close together on the map meant very steep hills and tired legs. The weather really could not have been better. However, that night there were a few members of the team rocking a nice lobster tan, as we had underestimated how hot the weather actually was. 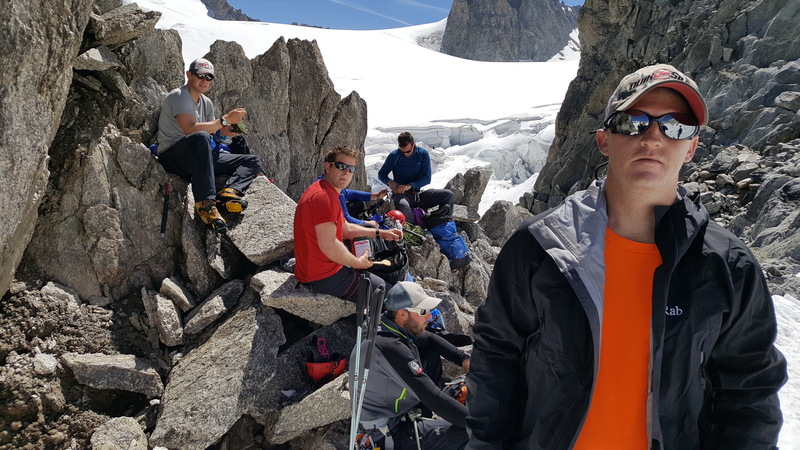 It was a first experience for many in the team walking over snow beside Lac Blanc in shorts and t-shirts, sweating profusely; little did we know, this would a common occurrence for the duration of the expedition. 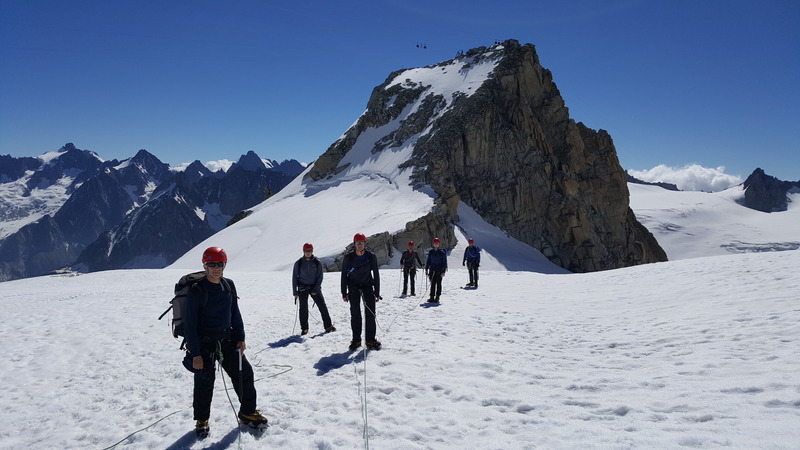 The following day our team departed from the villa with a backpack about twice the size of our guides but somehow carrying less equipment on a three day Alpine Adventure (up into the French Alps) than we would normally be comfortable with. I wasn’t one for looking at scenery generally, but the picturesque views the French Alps has to offer are truly breath-taking. They are like something off the front of a post-card and not one picture the group took will ever do the place justice. The three day Alpine expedition was absolutely brilliant. The learning curve was massive and there were a lot of racing heart and sweaty palm moments; nonetheless, the experience was something else. 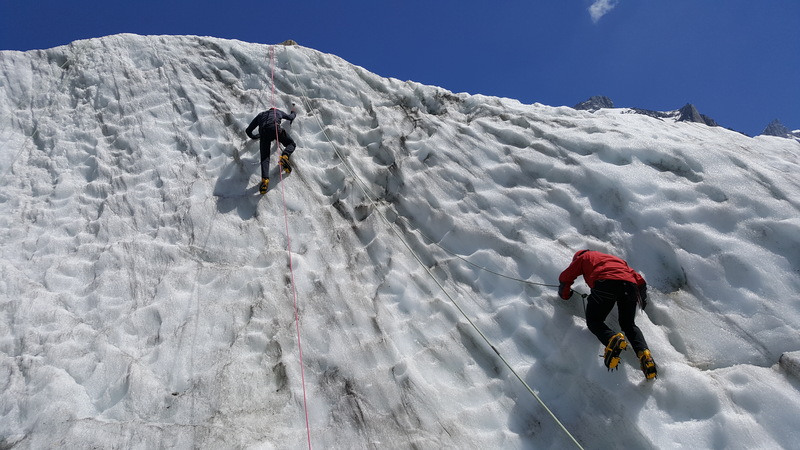 Climbing down into the Mer de Glace Glacier on the first day was one such experience. It can only really be described as climbing down some of the longest ladders you have ever seen bolted to a rock face, with some narrow ledges thrown in for good measure. Although, you are roped up, things are relatively safe and you never had any fear of heights before, you still hold on to each rung of the ladder like your life itself depended on it. 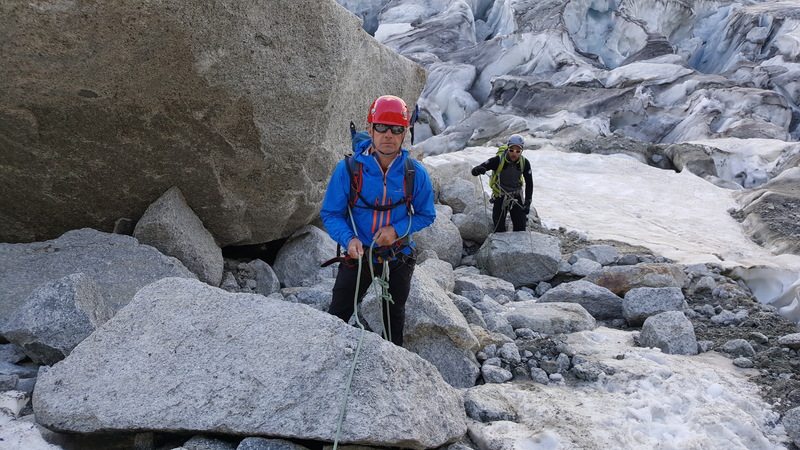 Once onto the Mer de Glace Glacier, we hiked for a few hours moving from rocks under foot into hard ice, avoiding the crevasses as best we could. Eventually after eating lunch and watching all the other parties practising ice climbing it was our turn to live the challenge. So we strapped on our crampons, armed ourselves with ice axes and attacked the ice wall. Ice climbing is harder than it looks. The frustrating thing is that some people (the boss) make it look easy, I use the excuse it’s because they are lighter, less pressure on the snow, and all that. Nonetheless, the entire team completed many ascents and descents (by abseil) each and were quite proficient at the end of the exercise. Leaving the ice walls we then continued along our path through the Mer de Glace, pausing periodically to look up at the cliff in the distance with the Refuge du Requin hut precariously perched on the edge; this was our final destination and home for the evening. 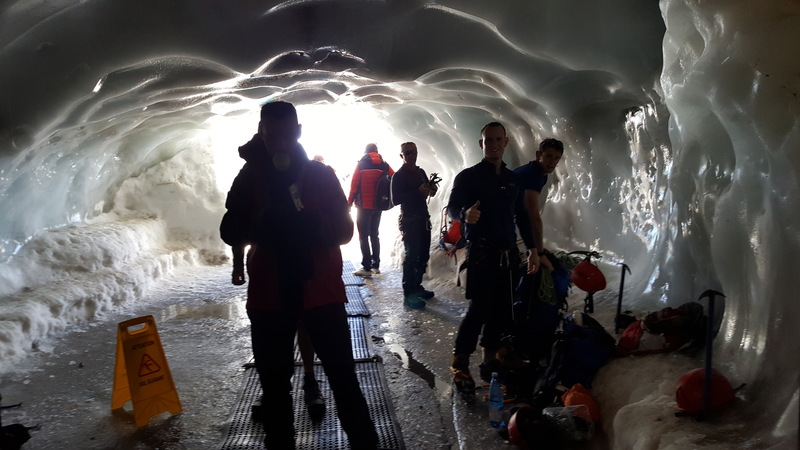 Of course, the hut was only reachable by climbing 100’s of metres of vertical ladders again mixed with scrambles between ladders on literally 4 inch square metal foot holds that had been engineered to the rock. This had been a long and rewarding day and we slept well that night. The following morning we were awoken early by the French accent of our guide Pierre “Good Morning Guys”. Within an hour we were on our way again, ascending further up into the Glacier du Tacul. Thank goodness we had been doing a lot of physical training before the exercise because with the height and altitude, advancing felt like as Blackadder once said “As fast as an asthmatic ant carrying heavy shopping”. After a few long hours of looking up to see what we had to do and looking behind to see what we had done, we arrived at a part of the expedition that is now ingrained in my mind. There was a part of the route (on le Petite Flambeau) leading up to our next refuge (the Torino Hut at 3,375m) that involved ‘scrambling’. Scrambling would have been hard on any rocky part of the climb, never mind when you look one foot left and one foot right to see what could only be described as sheer drops to death. Of course, any doubts we had were soon confirmed when Pierre told us “Don’t fall, you will die”. “Thanks, Pierre!”, I said. This was the most I felt out of my comfort zone since we started the expedition and I loved it! After this, nothing seemed as nerve wrecking. I suspect that this terrain was used by the guides to test us in preparation for the main event. 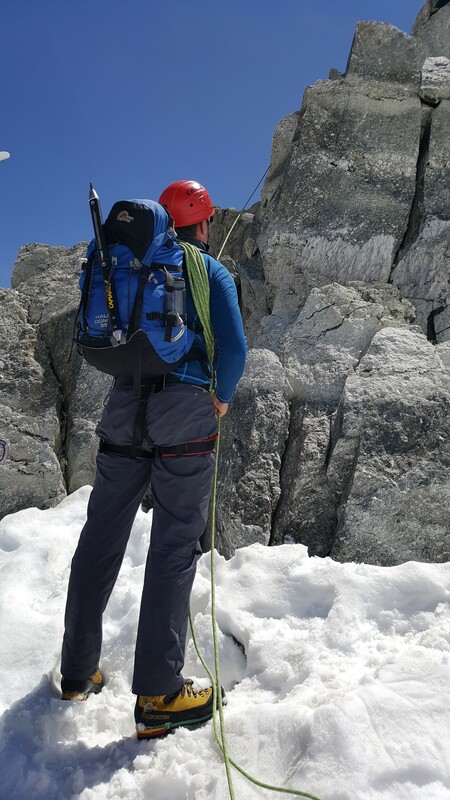 If we could not climb this, then there would be a concern regarding the competency of the team during the summit expedition on Mont Blanc. 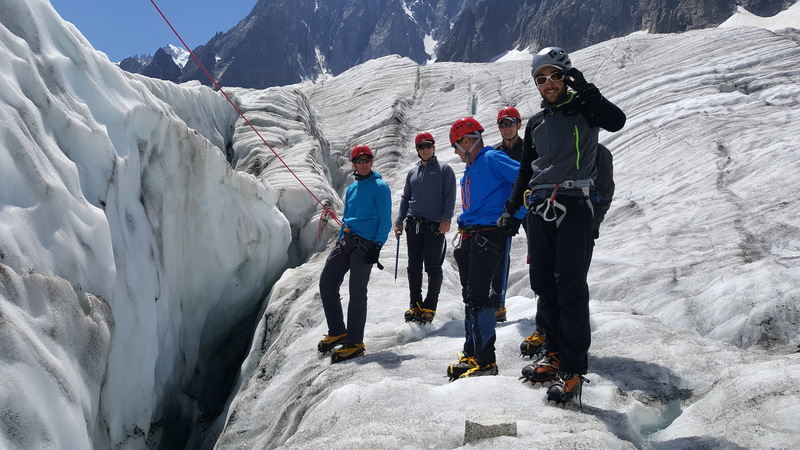 As it turned out this section was completed comfortably by all and it was clear to us that we had earned our spurs in the eyes of the French Alpine Guides. I overheard young Alex Gordon, one of the other members sharing with our expedition leader that, based on the experience of the ridge, “I am not sure if I am ready for the summit if it is going to be any worse than that!” (meaning the Petite Flambeau ridge), however, after several words of reassurance that the summit would not be as challenging (probably lies) his self-confidence returned. The night in the Torino Hut was an interesting experience. 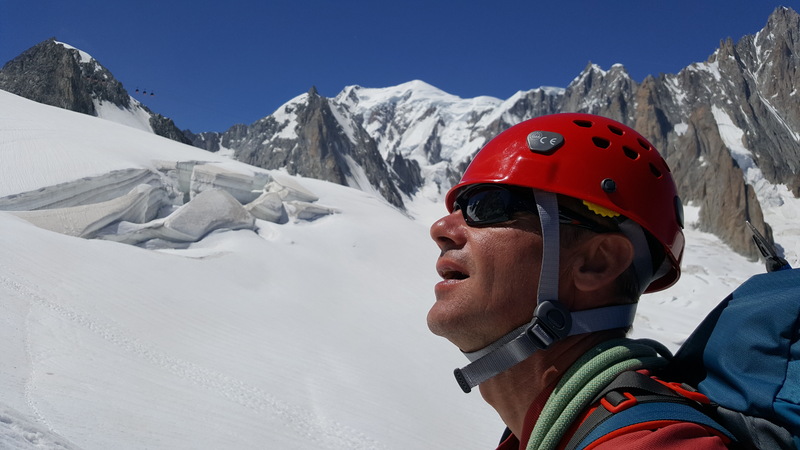 We had heard that it would become more difficult to sleep at altitude during our expedition training and this was the first actual experience of it. The next morning after a classic Italian breakfast we roped up and set off across the glacier. 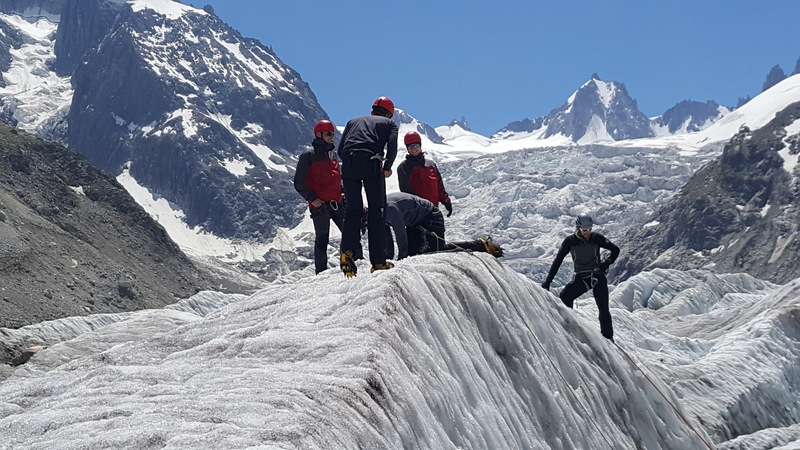 Here we practised ice axe arrests on the Glacier du Geant before progressing up the Vallée Blanche towards the Aiguille du Midi cable station. Words cannot capture the experience of following this snow trail that leads almost silently across fields of crevasses that are so deep you hardly dare to stare long enough for your eyes to focus as you step across! 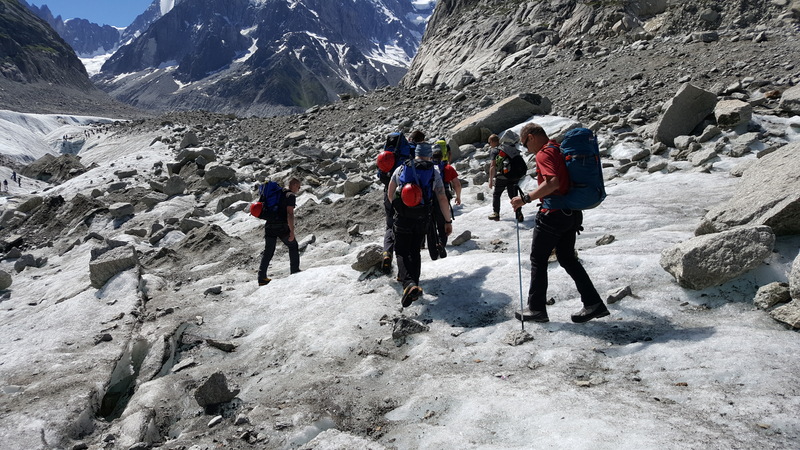 The final approach to the Midi was one of the most demanding parts of the day with everyone in the group now experiencing the effects of the altitude at 3,842 metres. As the cable car trundled our busy cable car speedily back to civilisation I could feel my body repairing itself as the altitude dropped back to normal. We were tired now after four days of relentless mountaineering and yet, without a break, the main challenge was now upon us, commencing the next morning. 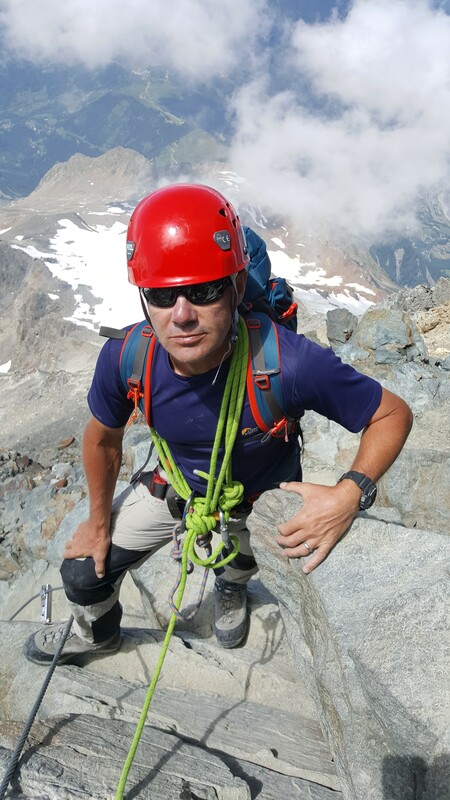 After a night back at the Villa in Chamonix to rest from the altitude and recuperate the body, on the morning of 21st June we met our guides at 0730 at the Les Houche Bellevue cable station. After a brief cable car and train journey to le Nid d’Aigle (2,373m), we started our journey to the rooftop of Europe. After a few hours of trekking we were faced with the infamous Grand Couloir. This is the most notorious area in the Chamonix Region, where many injuries and fatalities have occurred during ascents and descents of Mont Blanc; concerns about the crossing had been emphasised during our expedition briefings by the team leader and now we were standing in front of it! In this area rocks, ranging from the size of pebbles up to the size of fridges, launch down the mountain at ridiculous speeds, right across the access path to the Gouter Hut (3,815m), where climbers stay overnight before pushing for the summit. Thankfully, the entire team passed safely due to our early start, however, only 30 minutes later we could hear the thump and crash of the first rock falls of the day echoing down the valley, complimented by the shouts of the climbers who were caught in the drama that we had just avoided. 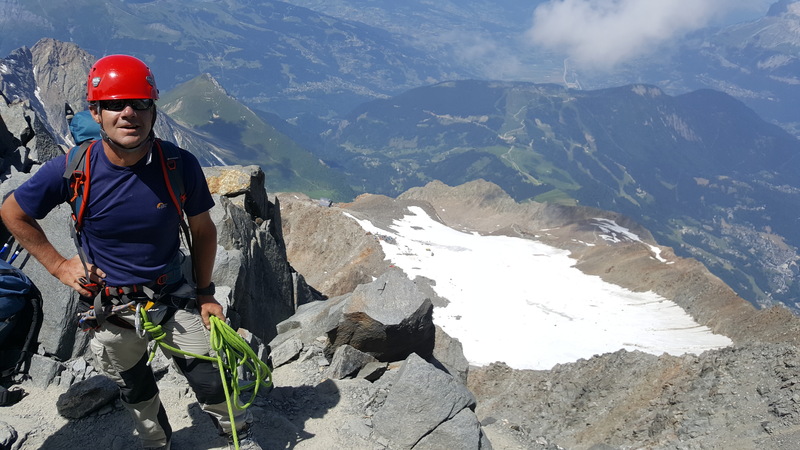 After a few more hours of hard work and scrambling we finally reached the Gouter Hut. This hut is well worth a google. It can only be explained as a large shiny spaceship looking house literally built on stilts, engineered onto the side of a cliff. Nonetheless, the accommodation really was terrific, even though they served us the most tasteless soup we had ever had. With a 0200 reveille, we were booted and suited to go at 0245. Head torches on, roped to our guides, off we set for the final push to the top. The air was cool but not as cold as we expected. It really does not take long to warm up when mountaineering in this environment. 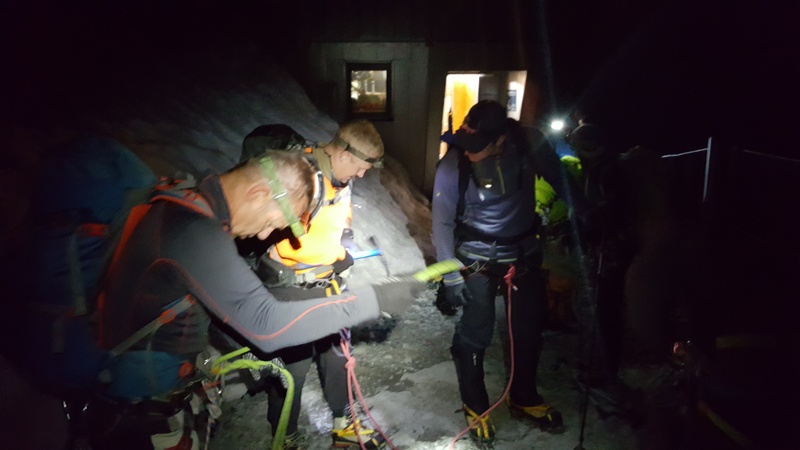 We followed a snake of head torches belonging to the other early rising climbers as we ascended up the Dome du Gouter to the Vallot Hut (4,362m). Here we managed to pause and witness the most incredible sunrise we have ever seen. The beams of orange sunlight piercing through the pure white peaks of the Alps really was a break taking sight indeed. From this point forward, whether we liked to admit it or not (typical squaddies), we were all feeling the altitude. Nevertheless, we pushed on at a steady, strong pace to the top. The narrow Bosses ridgeline was absolutely incredible. Words cannot begin to explain the exposure that I felt during this section of the ascent. The views were simply breath-taking! The last 100m, when we knew we had done it, took all our discipline not to run to the summit. When we reached the top though, my goodness, what a buzz! You can’t help but feel overawed with pride. We had done it – 6 months of training all culminating in a moment! Here we are, on the rooftop of Europe with a great group of lads and it was spectacular. 360 degree views of the beautiful ragged peaks, draped in the whitest of white snow of the Alps and not a cloud in the sky. There were about twenty people on the summit when we were on it, but, in the still French Alpine mountain air, this was the most peaceful place I think I have ever been. Every footstep taken, every inch climbed, every bead of sweat dropped was worth this prize a million times over. Of course we took the group pictures, with The Royal Irish Regiment Flag, but pictures will never do it justice. We had just made Regimental History and that was special! The descent greeted us with the scenery we missed climbing up in the dark. All of us, tramping along, all in our own world thinking about what we had achieved. 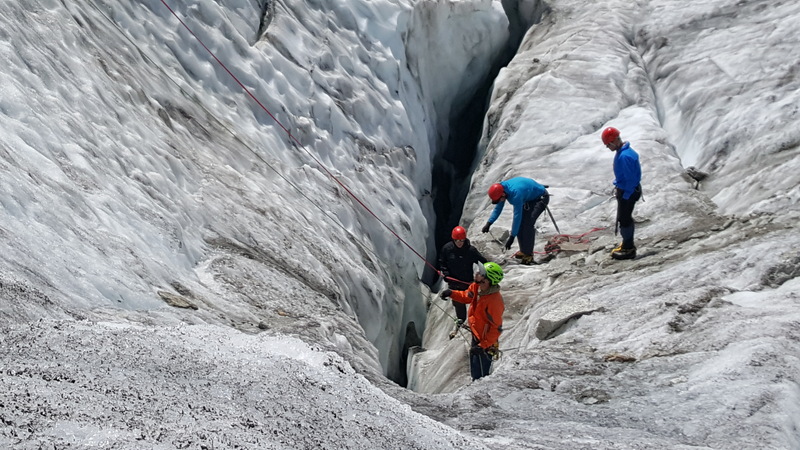 The descent back to Chamonix was quick (aided greatly by gravity) and thankfully uneventful, despite a rock fall in front of our eyes on the Grand Couloir, which left a group of English climbers hulled down for 5 minutes behind a large rock. 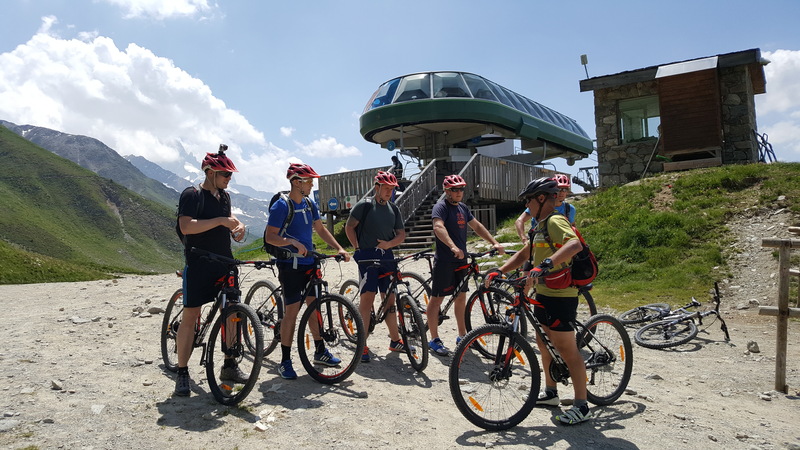 During the next few days we were kept busy rock climbing at Les Gaillands and mountain biking at La Tour, just in case we stopped long enough to feel tired. 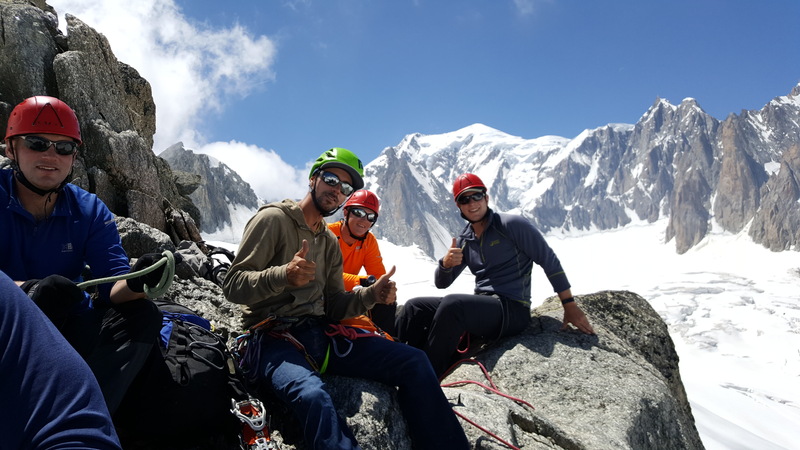 But hey, when you are in chamonix, the playground of Europe, it would have been crazy not to take advantage of all the opportunities available to us. This exercise was one of the greatest experiences we as a group have had so far in our lives. Yes people have climbed further and higher, but we, a team of alpine enthusiasts from 2 R IRISH in Northern Ireland, did it. And what we achieved overlaps massively into our military training; the fitness benefits and also the ability to push ourselves well outside our comfort zones is something that the British Army depend on. All in all, an unbelievable experience that no words or pictures will ever give justice to. 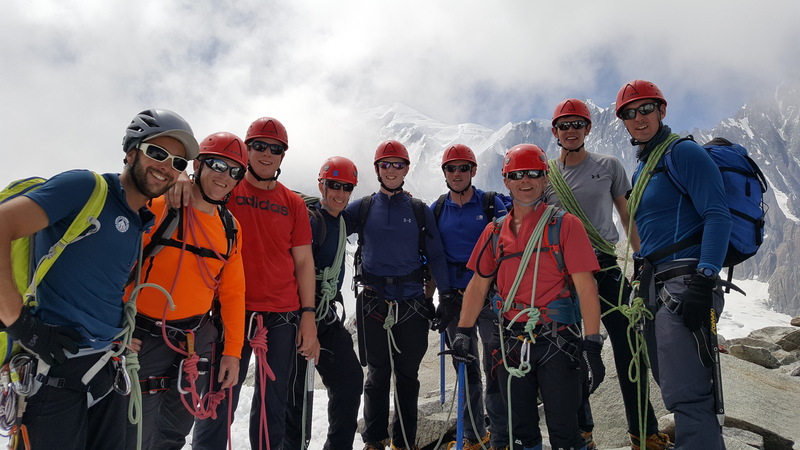 Finally, it needs to be recognised that expeditions such as this are only possible because organisations like The Ulysses Trust recognise the value of such training opportunities; by providing that very necessary financial support you make it all affordable. From all the Army Reserves on the expedition, thank you Ulysses Trust for all your support again in 2017. You helped to make Exercise SHAMROCK GLACIER happen.